Dynaudio Confidence C2 Signature review | What Hi-Fi? It’s an unusual name, Confidence, but it makes perfect sense for these clever floorstanders. The Dynaudio C2 Signature speakers are as bold a design as we’ve seen from Dynaudio, both from a technical and style viewpoint. There are two versions of this speaker. Our test model, the Signature, has a wonderfully luxurious feel with its Mocca and Bordeaux finishes. Other embellishments include an extended 10-year warranty and a signed plate on the rear panel bearing the signature of the company’s founder and owner, Wilfried Ehrenholz. The standard C2 II model does without any of this, but costs around a thousand pounds less. As you might imagine, the C2s’ appearance got a bit of a mixed reaction in our office. We like the unusual proportions, but we suspect that their defiantly avant-garde styling might not sit comfortably in more traditional rooms. There’s far less of an issue when it comes to the sound. A large part of the Signatures’ design is about making them less fussy about their placement in the room: the company calls it DDC (Dynaudio Directivity Control), and it’s all about controlling sonic dispersion. The combination of a symmetrical drive unit layout (including twin tweeters), a carefully shaped front baffle and an intricate crossover all aim to make the Signatures easier to position. And it works. Their sound didn’t change markedly even though we moved them around the room, and their balance stayed pretty consistent as we varied the listening distance too. That’s unusual with speakers. You still can’t put them too close to a wall, though: in our listening room, bass becomes a little overbearing if the speakers are much less than a metre or so from the rear wall, and in our experience the same – or worse – is true of most large speakers. These towers are imposing, even next to one of our strapping six-foot-tall reviewers. And, just like our writer, they’re tall, slim and deep. In fact, the cabinet isn’t quite wide enough for the twin mid/bass drivers to fit into – which is where that distinctive front baffle comes in. It’s shaped to minimise distortions caused by reflections from edges and corners, and also is decoupled from the main cabinet by a layer of fibreboard that reduces the amount of mechanical energy transferred from the drive units to the outer box. That’s always a good thing. Dynaudio has long been known for making top-class drive units, and the ones in the Confidence C2s are no exception. The tweeters are the latest version of the company’s range-topping Esotars: 28mm fabric domes with aluminium voice coils and extra powerful neodymium magnets – doubled-up, predominantly to help with dispersion. These twin tweeters are embedded into a solid aluminium block that gives them a solid foundation to work from, and to reduce the amount of external vibration that reaches them. A pair of the company’s distinctive 17cm mid/bass drivers delivers the sound from the midrange downwards. As is usual for Dynaudio, these look like they have an oversized dustcap – but they are, in fact, a one-piece design. That large dome shape helps to increase cone rigidity and improves output at the top end of drive unit’s frequency response. The cone material is a magnesium silicate polymer, something the company has used for years. The Confidence’s four drivers use a new crossover design that now includes higher-grade components and wiring, but their outputs aren’t quite paralleled-up. Instead they are carefully calibrated to give the C2’s the desired dispersion characteristics. Put it all together and you have some striking speakers with a rather distinctive sound. Refinement and cohesion are the Signatures’ standout qualities. As you’d expect at this price, there’s plenty of detail on offer, and at times quite breathtaking insight into the recordings and production process. But rarely do we come across a pair of high-end speakers that sound so smooth and yet deliver the leading edges of notes with such determination. Their real triumph, though, is that they deliver all this information without ever sounding even vaguely clinical. It’s a trap many otherwise capable rivals fall into. It all sounds so composed that these Dynaudios never even sound like they’re trying hard, and this kind of presentation works wonders with chaotic pieces of music such as Carl Orff’s Carmina Burana, but equally adds a lovely sense of calm to the likes of Ólafur Arnalds’ …And They Have Escaped the Weight of Darkness . Rhythmic precision is impressive. 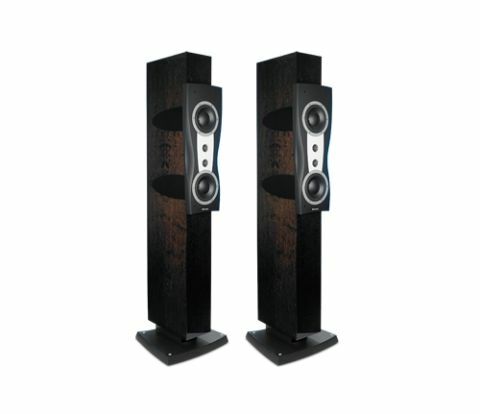 The C2s might not quite have the enthusiasm and rhythmic ability of the Triangle Magellan Cello SW2s (£6700), but they still sound surefooted and precise, conveying the momentum of Kanye West’s over-the-top Monster well. These are big speakers, and if you expect high volume levels and huge scale you’ll be mostly satisfied. Once positioned with care the C2s throw out a sound stage of impressive proportions: it’s wide and deep, and populated by precisely focussed instruments. These speakers go almost ridiculously loud, too – certainly enough to keep hardened head-bangers happy provided they have the right amplification. They’re are a little less impressive when it comes to digging down into really low frequencies, however. Listen to the likes of The Dark Knight Rises soundtrack and the Signatures don’t quite thud with the conviction of similarly priced rivals. There’s plenty of bass detail, but you don’t quite get the dynamic slam or authority of the ATC SCM 100As (£11,615) or B&W 800 Diamonds (£18,000), say. It seems there’s only so much the relative small mid/bass drivers can do, even if they’re doubled up. There’s also a subtle excess richness to the presentation from the midrange downwards that robs these speakers of just a little transparency and vigour, although we think careful partnering with more upbeat amplification – Plinius or Naim are a good place to start – would work well. But we can’t complain too much, because this characteristic is also partly responsible for the C2s’ easygoing nature. We like these Dynaudios. They’re revealing without being fussy, and built to terrifically high standards. In the right set-up they can really sing, too. Confidence? That’s a pretty apt name.